A medium roasted coffee, which is also our most popular flavor – you’ll find much about it to enjoy. The rich, nutty flavor of our Hazelnut Crème coffee creates a smooth coffee experience with a hint of sweetness. This unique quality allows the coffee to be consumed as a breakfast coffee, middle of the day pick-me-up, or with your after-dinner dessert. The delicious flavor of hazelnuts is added to our gourmet South and Central American coffee beans and roasted with a time-honored tradition to create the Hazelnut Crème coffee that everyone has grown to love. Yum. I had never heard of New England Coffee and decided to give this a try. It’s very good; I’m interested to try some of the other flavors now. I saw a sale price of $5.99 a bag at my local grocery store. The packaging on the shelf doesn’t really stand out; maybe that’s why I had previously missed it. Re-brand to stand out on the grocery store shelf. You have some fierce competition. 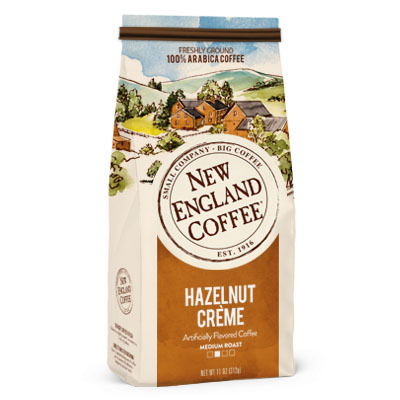 Love New England Coffee, especially Hazelnut Creme. I use the single serve and thinking about buying the ground. I love opening up the package in the morning to that beautiful hazelnut aroma. It’s a wonderful start to my day. I’m going to try some of the other flavors, too. Once I tried this brand, I couldn’t go back. Its mellowness and flavor are unsurpassed! Much better than other brands who try to make “Hazelnut Creme” flavor (hazelnut + vanilla)! Best flavored coffee out there. Smooth creamy and just perfect. By far, the best tasting, most natural flavored hazelnut coffee light roast there is. The aroma while it brews to the first taste, makes my day! I can easily pass a coffee shop to make my own at home! I’ll blend Donut Shoppe with Hazelnut Creme for a switch up! Thank you for great coffee, always! this coffee is amazing. i found it, then after a few bags, the store failed to stock it, so im here ordering more. i use a heavy hazelnut cream in it and brew it dark. cant get enough. The very best coffee we have ever had! 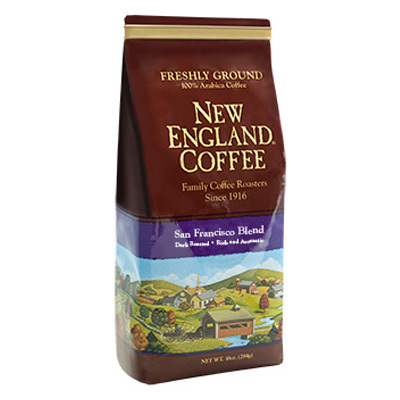 I have not tasted a coffee that I didn’t like from New England Coffee!! It’s smooth and not bitter! Love it!! Perfect cup every time. Love the aroma and the taste. My wife and I tried it and don’t want any other coffee. We try to keep a good supply on hand at all times. After my wife and I tried your coffee we want no other. We try to keep a supply on hand at all times. I have enjoyed this blend ever since I was introduced to it about 4 years ago. Thank you New England Coffee for this very pleasant taste. The absolute best smelling and tasting coffee ever! My local grocery store is often sold out, so yes, it’s really that good. Just the perfect touch of sweet flavor without having to add a bunch of creamers or sugar. Our absolute favorite coffee and flavor ever. So smooth and delicious. My husband and I look forward to drinking it each morning! New England is really the best!